Deionized Water, Sodium Lauroyl Methyl Isethionate (and) Cocamidopropyl Betaine (and) Sodium Cocoyl Isethionate (and) Sodium Methyl Oleoyl Taurate, Polyquaternium-7 (and) Sericin (and) Guar Hydroxypropyltrimonium Chloride (and) Cetrimonium Chloride (and) Behentrimonium Chloride, Cocamidopropyl Hydroxysultaine, Sodium Cocoyl Glutamate, Glycerin, Propanediol, Hydrolyzed Jojoba Esters (and) Jojoba Esters, Stem Cell Conditioned Media, Amodimethicone, Arginine (and) Lactic Acid (and) Glycine Soja (Soybean) Germ Extract (and) Triticum Vulgare (Wheat) Germ Extract (and) Sculletaria Baicalensis, Root Extract, Urea (and) Saccharide Hydrolysate (and) Magnesium Aspartate (and) Glycine (and) Alanine (and) Creatine, Hydrolyzed Quinoa Protein, Hydrolyzed Kale Protein, Hydrolyzed Lemon Protein, Hydrolyzed Carrot Protein, Panthenol (Pro-Vitamin B5), Phenoxyethanol, Ethylhexylglycerin, Mentha Piperita (Peppermint) Leaf Oil, Menthol, Eucalyptus Globulus (Eucalyptus) Leaf Oil, Rosmarinus Officinalis Rosemary) Leaf Oil, Melaleuca Alternifolia (Tea Tree) Leaf Oil. Wet scalp and hair with warm water. Apply a dime-sized amount of shampoo to the top of your head and massage gently into a foam. Use the foam created on your scalp to wash the remainder of your hair. Leave shampoo on the scalp for one to two minutes, then rinse with lukewarm water. 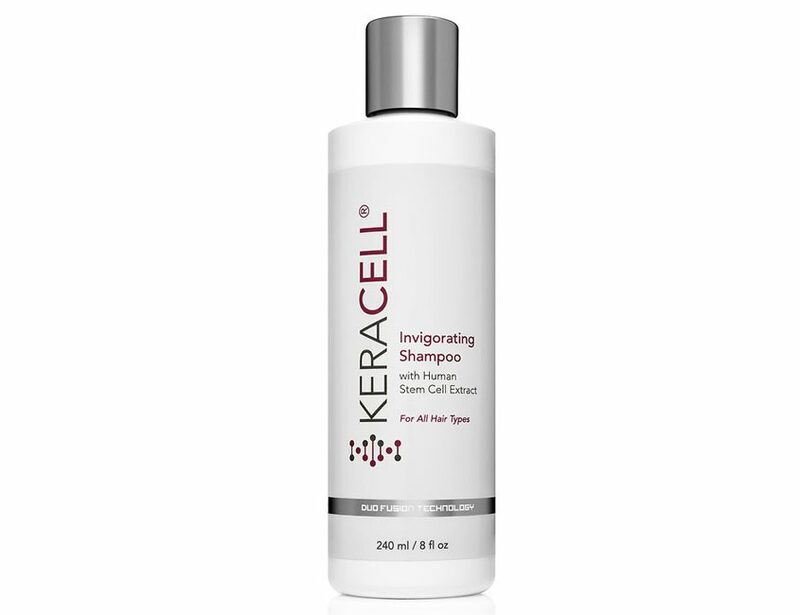 Follow with KERACELL® Fortifying Conditioner and KERACELL®Leave-ln Strengthening Spray then style hair as usual.